As was expected, the Samsung Galaxy S6 is another industry leading flagship smartphone, packing in some of the latest and greatest pieces of mobile tech. This time though, Samsung has opted to exclusively use its in-house Exynos 7420 SoC, rather than a Qualcomm processor as it has done in previous years. So, let’s delve into the specifics to see why Samsung has so much confidence in its latest SoC. One of the Exynos 7420’s big talking points has been the move down to a 14nm FinFET manufacturing process, which puts Samsung ahead of Qualcomm’s 20nm Snapdragon 810. When it comes to manufacturing size, smaller numbers are better, as shorter transistor distances consume less energy and boost processing speeds. However, smaller, closely packed transistors can lead to current leakage between parts of the chip, an issue that FinFET manufacturing addresses by enclosing the conducting channel in a thin silicon “fin”. For the same processor design, lower power consumption means more heat headroom for increasing clock speeds or additional battery savings, which will help explain some of the capabilities of Samsung’s chip as we dive down deeper. The bulk of the Exynos 7420’s processing components are rather familiar. It is built from ARM’s reference Cortex-A57 and A53 CPU cores and its Mali-T760 GPU technology. At a quick glance, the design is very similar to the Galaxy Note 4’s Exynos 5433 chip. 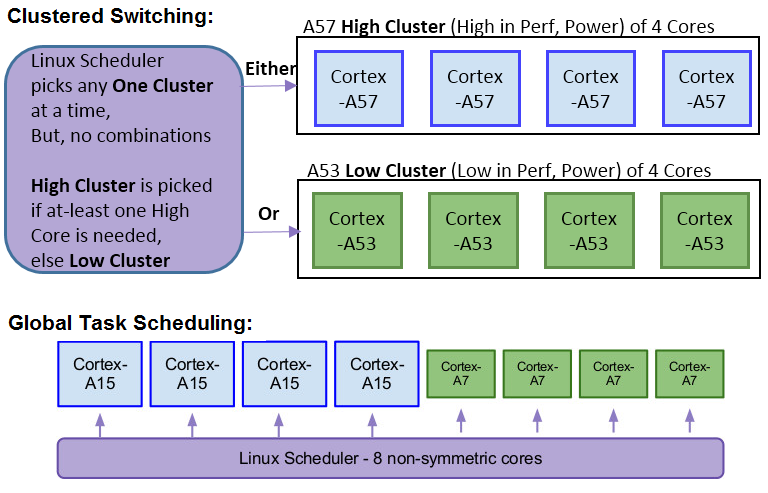 Samsung is using ARM’s high-end octa-core Cortex-A57 and A53 big.LITTLE configuration for an efficient balance between peak performance, using the Cortex-A57s, and energy efficiency, by delegating background tasks to the low power Cortex-A53s. Samsung has again implemented Global Task Scheduling with this chip, which enables the use of eight cores at the same time, as well as dynamic core voltage and frequency switching. The Exynos 7420 also implements ARM’s AArch64 64-bit execution state, while the Exynos 5433 will likely only ever use AArch32 (32-bit mode), even though it uses ARMv8-A CPU components. While 64-bit app support is slowly gaining momentum, Android Lollipop’s ART runtime is optimized for 64-bit processors and so should result in a few performance benefits for the 7420 too, depending on the situation. For example, all pure Java apps receive instant benefits from ART’s 64-bit optimizations. Thanks to the smaller manufacturing process, Samsung has been able to up its clock speeds by 200MHz on the CPU side and by 72MHz on the GPU side, working out to around a very rough 10 percent increase over the Exynos 5433. While this will inevitably lead to some performance gains, the biggest changes have been made to the SoC’s memory and GPU specifications. The Exynos 7420 is Samsung’s first SoC with LPDDR4 memory, which runs in a 32-bit dual-channel configuration with a clock speed of 1552MHz. Peak bandwidth reaches 25.6 GB/s. The GPU is where Samsung has implemented the largest performance gains-over the Exynos 5 series. This already adds up to tangible improvements so far, but the GPU is where Samsung has implemented the largest performance gains-over the Exynos 5 series. As well as the clock speed increase, Samsung has scaled up the number of GPU cores from six in the Note 4 to eight in the Galaxy S6. This extra graphics grunt will come in handy when gaming on the Galaxy S6’s QHD display, and the smaller 14nm manufacturing size has also allowed Samsung to drop the GPU voltage by between 200 and 300 mV at 700MHz. Samsung states that the move to 14nm reduces power consumption by 35 percent and much of that saving looks to have been pumped back into the two additional GPU cores. 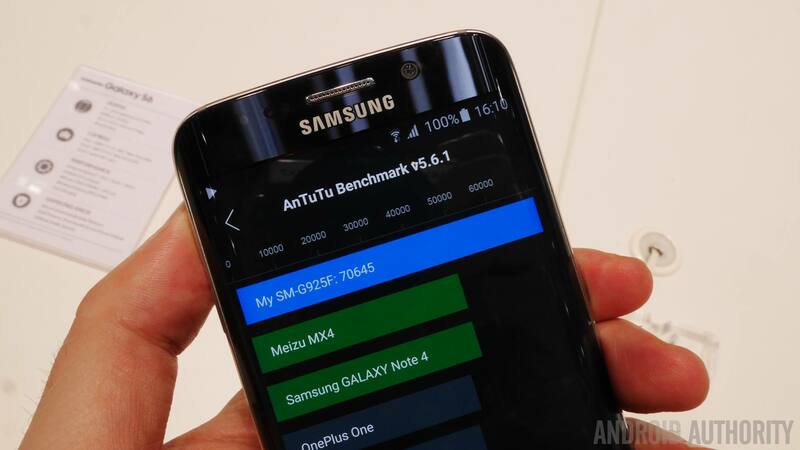 Comparing our Galaxy S6 AnTuTu test against the Galaxy Note 4 (SM-N910C), we see a rather substantial increase when it comes to 3D graphics performance at 2560×1440. Benchmarks don’t indicate real world performance differentials, but it certainly confirm the areas in which Samsung has managed to make improvements. RAM speed also sees a decent performance gain from the move to LPDDR4 and AnTuTu also registers a favorable boost to the CPU’s capabilities too, due to the smaller die size and higher clock speeds. With performance up and energy consumption down, Samsung’s push for 14nm has clearly paid off and it is clear why the company chose to drop Qualcomm’s Snapdragon series this generation. Although CPU performance is only marginally better than some existing flagships, additional GPU performance and battery savings are precious improvements for Samsung’s QHD Galaxy S6. The Exynos 7420 will likely remain a top performer throughout 2015, as Qualcomm is not looking to reach sub-20nm until end of the 2015.